It is through the work of artists such as Rose Borchovski that we see the exceptional possibility and promise of art in virtual spaces. Brilliantly conceived and executed, her newly opened installation The Arrival is a tour de force that ranks in the top echelon of immersive art. My friend Rowan Derryth has already written an eloquent, cogent and persuasive essay about The Arrival for the Linden Endowment for the Arts blog, and I would encourage you to read her perceptive thoughts. But in brief the work is quintessential Rose Borchovski: a whirlwind mix of innocence and violence wrapped inside a simple narrative structure that offers multiple interpretations, brought to life by the Susas (child-like characters from earlier installations) and recurring elements such as fish, eyes, pigs and water. Here, the Susas marvel that a colossal fish (a whale, perhaps) has washed ashore. "Breaking news!" 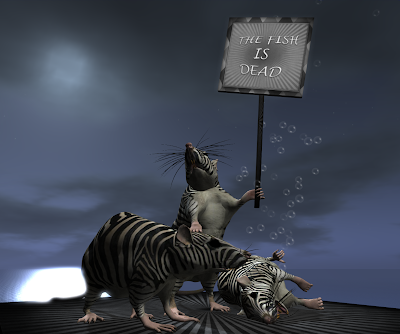 they shout—but then while they revel the fish expires, leaving them wondering whether they're responsible for its death. Beneath it all, we're left conjecturing, "What's really happening here?" Rose offers four possibilities, outlined in an introductory notecard, but even then more layering is present. The central element—the giant fish—is fantastically rendered, but so are the tiniest of objects, and there are many, all crafted with exquisite care. 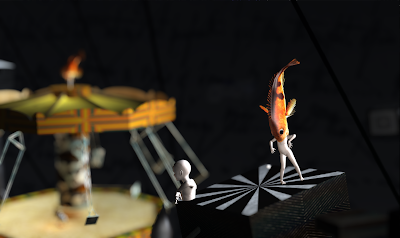 A book read by one of the Susas under a carousel brought a smile to my face: fish swim across its pages—well, you'll just have to see it, a little jewel. When you arrive, it's probably best to take the teleport rather than embarking on foot, as that will set you off on the most logical course. Be certain while you visit to have your sounds turned up—they're an essential part of the experience, as is the parcel windlight setting. Scripter Caer Balough, who has worked closely with Rose for years, must also be noted for her contributions. Wonderful post, and fantastic images as ever! Love the last one in particular! Thanks very much, Rowan—your blog post already said 99% of what I would have said, and said it well!